In Galatians 5:1 the Apostle Paul says, “It is for freedom that Christ has set us free. Stand firm then, and do not let yourselves be burdened again by a yoke of slavery.” Paul got this idea from Jesus, who said, “You shall know the truth and the truth shall make you free; and if the Son sets you free, you shall be free indeed” (John 8:36). And the freedom Jesus was talking about was already a big part of God’s activity in the Old Testament in which the central, defining event was when the Hebrews were freed from the years of slavery in Egypt. Freedom is a big theme in the Bible. Freedom is also a big theme in the United States of America. On July 4, 1776 the Declaration of Independence was signed, declaring our freedom and independence from British rule, and, the intent to build our own government, one based on freedom for all. The spiritual freedom described in the Bible, and the political freedom we try to maintain as a nation, are not the same thing. But they are not totally unrelated. In Galatians 5:1 Paul warned that freedom may be lost. Stand firm, he said, and do not let yourselves be burdened again by a yoke of slavery. Spiritual freedom can be lost, is what Paul implied by giving that warning. The political freedom that we have come to take for granted can also be lost. In a 2012 speech Christian scholar Os Guinness asked, Can Freedom Last Forever? He was referring to political freedom, and his warning was that yes, indeed, that freedom can be lost. But the most interesting part of what he says is that political freedom is best maintained by allowing religious freedom. In fact, Guinness said that the main thing to remember about politics is that politics is not the main thing. Religion, he said, is the main thing. Politics is necessary and useful for our brief time on earth, but religion– our faith in God– is necessary for all eternity. Religion is also necessary for our political freedom and life together as a nation. Guinness then described political freedom. There are three parts, he said, to a nation’s freedom. First of all, there is the winning of that freedom. That fight to win that freedom began in 1776 with the Declaration of Independence and lasted until George Washington defeated General Cornwallis at Yorktown in 1781. It was an extremely difficult five years for the colonists, but in the end, the Revolutionary war was won, and freedom was achieved, and the United States of America was born. The next part of freedom was to prove even more difficult. The second part is the ordering of that freedom; the formation and establishment of a government in which people could live and work together with freedom for all. After the war, the thirteen colonies were free from Britain, but now those thirteen independent colonies had to find a way to maintain their freedom while at the same time work together. The ordering of freedom was accomplished in the writing and ratifying of the United States Constitution, that document which orders our free life together. That was another long and difficult process, taking more time to complete than it took to win the war. But it was completed in 1787, ratified over the next two years, and life as a nation under the new president George Washington began in 1789. The third part to freedom in a nation, and by far the most difficult, is the sustaining of that freedom. First, freedom had to be won for the colonies; then the new nation had to order itself; and then, if done well, that ordering would sustain that freedom for many years to come. In 1789 the French won their freedom from an oppressive government, and in 1917 the Russians overthrew their corrupt government. But in both cases, the quest for freedom failed and chaos resulted, because the freedom was not properly ordered or sustained. After 240 years we Americans are still free, but it remains a challenge to sustain that freedom amidst the many challenges and threats from within and without. The Founding Fathers knew their history, and they knew that one of the basic lessons of history is that nothing ever lasts. Nations, empires, kingdoms, and governments all come and go. But the founding fathers set as their goal to defy history, and to do something that had never been done before. They wanted to create something that would last. The new nation had one big advantage and one great danger. The great advantage was they were relatively free of enemies. They had just defeated Great Britain, the most powerful nation on earth. They were able to do so because a great ocean separated them from Britain, and for the time being, that same ocean would keep all other threatening nations at a safe distance. The United States was able to develop as a nation without threatening enemies. But the Founding Fathers knew that not only did nations fail because of outside enemies, but the even greater danger was that successful nations would be corrupted and rot from within. This, after all, had been the fate of the Roman Empire, the greatest empire the world had ever known. The hard-working, loyal, noble, and just Romans who had built that great empire, deteriorated into spoiled, greedy, immoral pleasure-seekers, who lived only to be entertained, caring not at all for character, courage, justice, or loyalty. 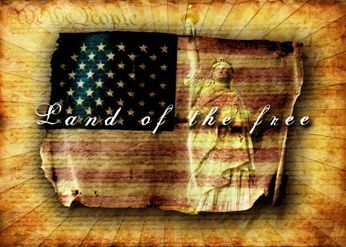 If the United States of America was to remain a free nation, it would depend a great deal on the goodness and virtue of the people who were being given such freedom. Galatians 5:1 — It is for freedom that Christ has set us free. Stand firm, then, and do not let yourselves be burdened again by a yoke of slavery. II Corinthians 3:17 — Now the Lord is the Spirit, and where the Spirit of the Lord is, there is freedom. Almighty God, we give you thanks for giving us a land in which we are free to read and hear your Word, to confess your name, and to labor together for the extension of your kingdom. We pray that you grant that the liberty given unto us may be continued to our children and our children’s children, and that the Gospel may here abound, to the blessing of all nations of the earth, and to your eternal glory; through your Son, Jesus Christ our Lord. Amen.